The Ultra-Space Field Theory is alternative physics model. It is simpler, more streamlined, and designed for visual thinking. An additional benefit to the use of this model is its potential for new ways to connect the dots, resulting in new inventions and new technologies. As a new model, archaic assumptions from the Standard Model have been reexamined and modified, or dropped entirely, due to a lack of hard supporting evidence. 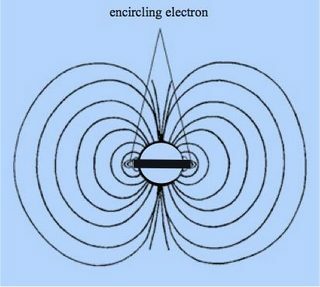 The notion of electron spin, for example, has been dropped, because there is no supporting evidence, and it has been known for a couple of decades now, that electrons seem to have no north and south poles. Electron spin has become a purely mathematical concept, with no true understanding of how it works. The Standard Model and the Ultra-Space Field Theory, as one might expect, have a large number of similarities. It is the differences in details which separate the two models. One is for mathematicians. The other is for people with the ability to visualize. The Standard Model describes the joining of an electron and positron as pair annihilation and their separation as pair production. This is based on Einstein's equation E=mc2 (energy equals matter). The Ultra-Space Field Theory builds a very different model, an aether/electromagnetic field model capable of supporting quarks and electromagnetic waves. A medium, the aether, transports quarks (bits' o subatomic kinetic energy), which on the macroscopic level is seen as electromagnetic waves. Thermons (ultra-subatomic coulombic black holes), formed by joined electrons-positrons, make up the aether/electromagnetic field. In this model, electrical contractions of space are the source of gravity. Thermons are a weak source of gravity, and provide a foundation for the missing dark matter. A proton is the result of two positrons joined to an electron. 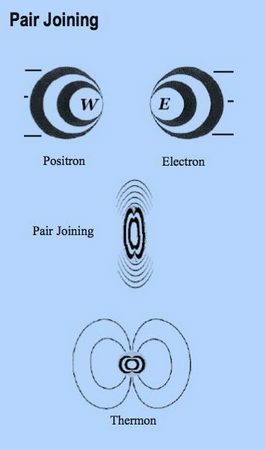 (One electron and one positron are released during pair separation/production, suggesting an imbalance. Where have all the positrons gone?) Protons are very stable, and have much stronger gravity fields and magnetic fields than the thermon. Per the Standard Model, within an atom, neutrons and protons are held together by a particle called a gluon. The USFT model describes the core of an atom as made up of pseudo-neutrons (or neutralized protons), with electrons acting as the gluons. A true neutron only exists after separating from the atomic core, and breaks down to an electron and proton after roughly ten minutes. The flaws and unproven assumptions which are inherent within the Standard Model are too numerous to list in this article. If you have an interest in alternative physics models, new technologies, and/or creating inventions, check out the Ultra-Space Field Theory at: http://vixra.org/author/keith_d_foote .